SPANISH authorities are looking for a shredder to dispose of a rubber mountain that has been building up for 13 years. 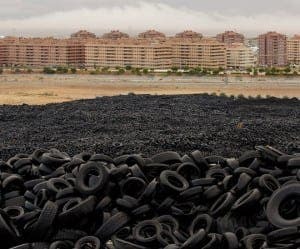 The 90,000 tonne heap composed of five million tyres is a blot on the landscape overshadowing a housing estate between Toledo and Madrid, as well as a serious fire and environmental hazard. Local authorities announced in October they are putting out a tender from January to find a company to shred the tyres, which have been there since 2002. A company originally in charge with recycling them was too small to cope with the vast operation and folded in 2011. Next articleHalloween in Spain: Trick or tradition? In Canada, and I think the US, they shred old tyres and mix them with new tarmac being laid on roads to have a threefold benefit. Firstly it makes the tarmac more water resistant, secondly it gives the roads more grip in the wet and thirdly they’re much, much quieter to drive on. In that case the companies should be buying the tyres from the town to enhance their tarmac not being paid to take them away.